The issue appears to be that the page's CSS causes the links in the sidebar to be display: flex, and that changes how the children are treated. The content is no longer a paragraph-like structure that wraps normally. Instead, it is a series of boxes that align left to right. That means that the text before a math item is one box, the math is another, and the text that follows is a third. By default, these must appear all on one line, so the initial text is wrapped, as is the final text, and the math is smashed in between. Since these three boxes don't fit in the allowed horizontal space, the three boxes overlap, as in your diagram. I'm not sure when the change to the CSS occurred, nor what the purpose of it is. It seems that it might simply be to allow the question title to be centered relative to the score on to its left. I suspect that a fix would be to put the contents of the <a> element into a <span> so that there is only one child of the flex container (whose content will wrap normally). Not the answer you're looking for? 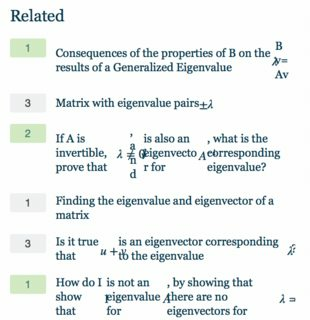 Browse other questions tagged bug mathjax design related-questions .